County Tipperary, between 1898 and 2014 County Tipperary was divided into two counties, North Tipperary and South Tipperary, which were unified under the Local Government Reform Act 2014, which came into effect following the 2014 local elections on 3 June 2014. It is located in the province of Munster. The county was established in the early thirteenth century, shortly after the Norman invasion of Ireland. The population of the entire county was 160,441 at the 2016 census. The town is a medieval foundation and became a population centre in the early 13th century. 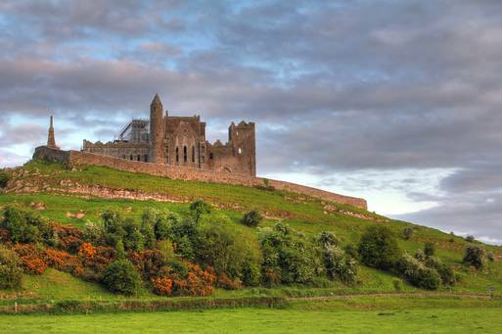 The Rock of Cashel was the Seat of the High Kings of Munster including Brian Boru victorious at the Battle of Clontarf against the Vikings 1014 ad. Tipperary is the sixth largest of the 32 counties and the region is part of the central plain of Ireland, but the diverse terrain contains several mountain ranges: the Knockmealdown, the Galtee, the Arra Hills and the Silvermine Mountains. Most of the county is drained by the River Suir; the north-western part by tributaries of the River Shannon; the eastern part by the River Nore; the south-western corner by the Munster Blackwater. No part of the county touches the coast.